Tiny Troopers is an app video game by Chillingo available for IOS Android for iPhones and iPads devices as well as Sony's PlayStation through the Appstore. 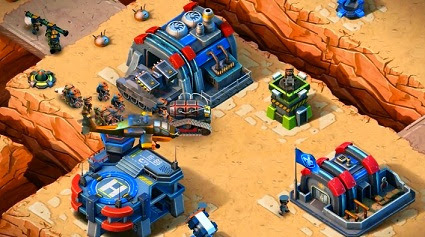 In the game, a blue horizontal flag with a white eagle is displayed above the "Barracks" (where you train military units or "tiny troopers"), as seen on the bottom right here (source). Looking at this video (0:12) one can see the waving flag (bottom right of the screen). 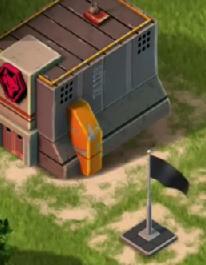 There's also in the game a "rogue General", called General Wolf. His emblem is a red wolf and his headquarters use a plain black flag. These two flags emblems (the flag and the red wolf) resemble pretty much the Command & Conquer ones, where the "allies" are identified by an eagle and blue colors and "enemies" are identified by a red animal, in this case a wolf (hence, General Wolf) (in Command & Conquer it was a red scorpion over red/black colors. These emblems all feature the background of representing the US and the USSR conflict during the Cold War in an "alternate" or fictional (virtual) world where there is actual direct confrontation.